For Mains: Infrastructure development- need, challenges and solutions. Context: The National Highways Authority of India (NHAI) plans to raise Rs10,000 crore through Bharatmala Taxable Bonds in the ongoing financial year. As per the internal and extra budgetary resources approved for 2018-19 by the government, a sum of Rs62,000 crore is to be raised by NHAI through various instruments/sources including Bharatmala bonds. 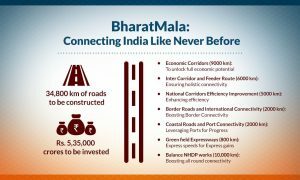 Bharatmala Project is the second largest highways construction project in the country since NHDP, under which almost 50,000 km or highway roads were targeted across the country. 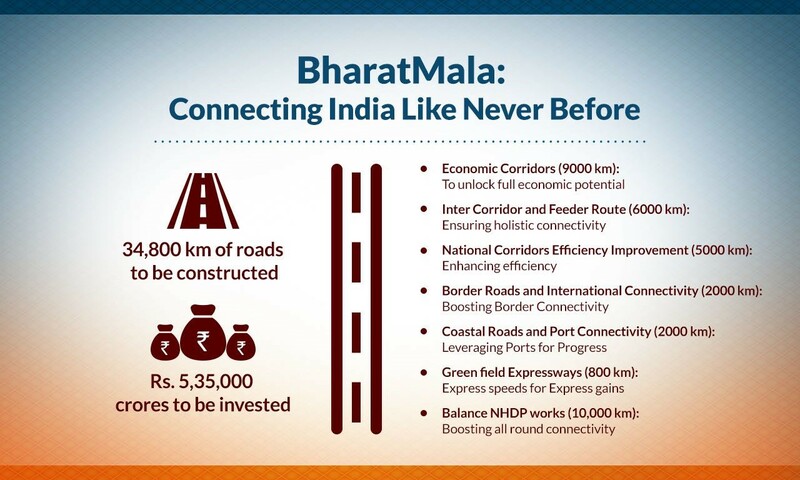 Bharatmala will look to improve connectivity particularly on economic corridors, border areas and far flung areas with an aim of quicker movement of cargo and boosting exports. Mains Question: Critically examine the features of Bharatmala Pariyojana (BMP) initiative and its likely impact on economic growth of India.